I am doing the valve adjustment. Yesterday I recieved the new shims, and today I have fitted new shims and the buckets. 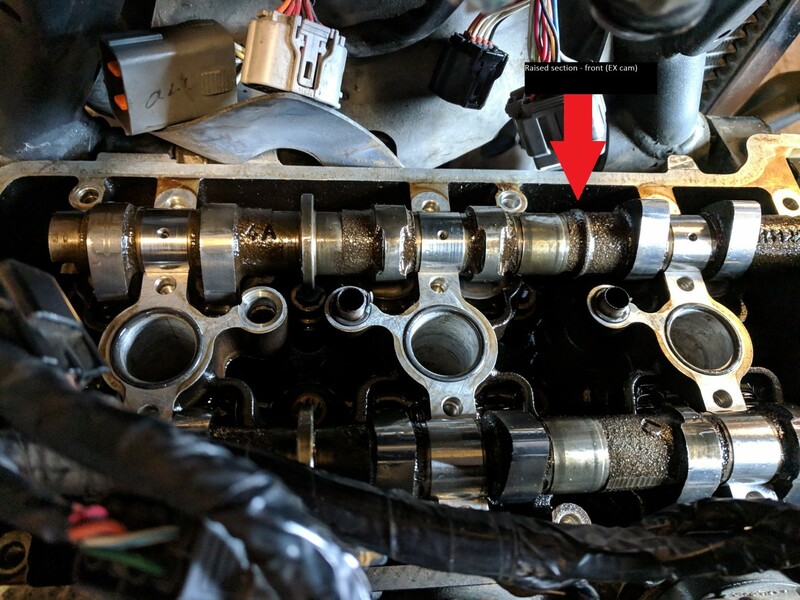 The manual (both the workshop manual and the aftermarket Mark Barrets service manual) state that the clean camshaft is the exhaust and the one with the raised section is the inlet. So, I proceed to place the cams as stated by manual. 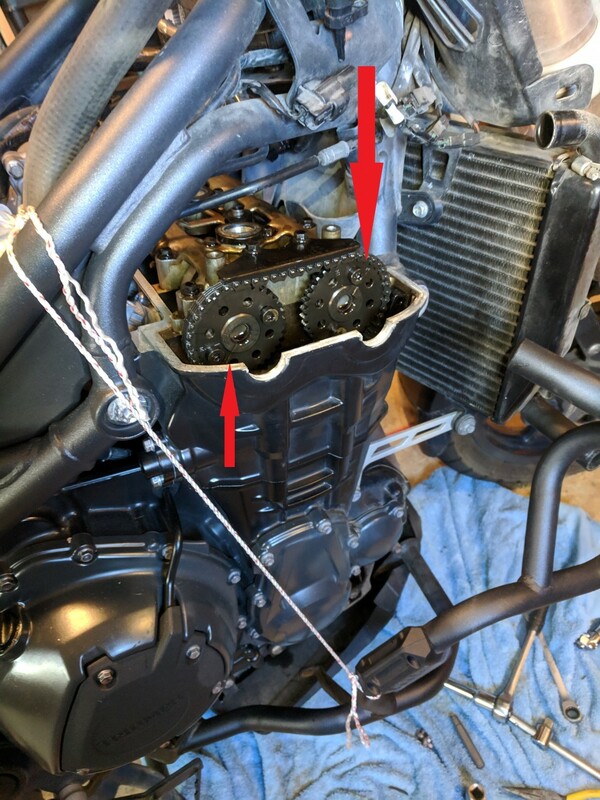 When I opened the engine, the camshaft with the raised section was placed on the exhaust side (towards front of bike) and the clean camshaft was placed on the inlet side (towards back of bike). The markings on each cam indicates exhaust in front and inlet in back (ie: The markings on the sprockets/camshafts are correct - but the camshaft itself seems to be switched as per the manual). I am 100% sure of this, as I took pictures before lifting the camshafts out of the engine. I have not removed the sprockets, as the timing was perfect as measured with the timing tool. 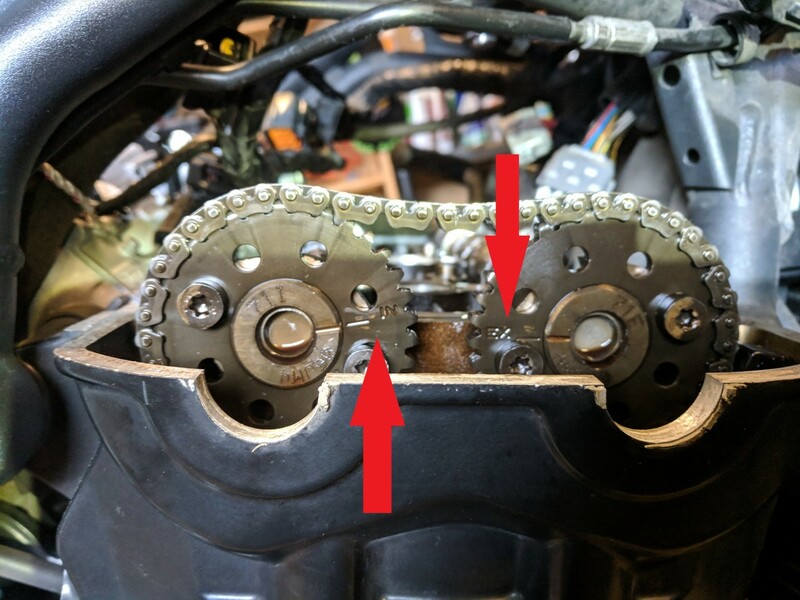 My theory: Either the sprockets were mixed when the bike was assembled by the factory (most likely) or someone else have mixed them at the 5000km service (unlikely). So: If you follow the markings on the sprockets, the camshafts is not correctly placed according to the manual. But this was the way the camshafts were placed before i removed them. If you disregard the markings on the sprockets, the cams are correctly placed according to the manual. But then they are switched as to how they were before I removed them. 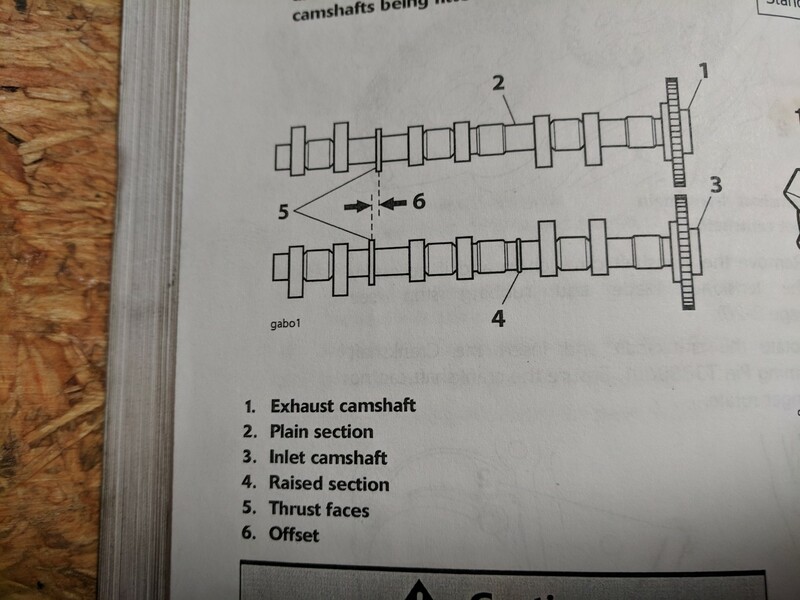 Is the lifting height of each camshaft identical, or is there a difference? Any advice what to do? I could put them back the way they was. Or not. I am beginning ot regret the day I bought a Triumph instead of a Kwak.... anyaway: I have not noticed anythin on the bike (it has 36000 km on it), no excessive wear in the engine, or anything that would indicate something wrong). Any advice appreciated. I have enclosed some pictures for illustrations. If Im looking at your picture the right way, they are exactly where they should be..intake in the rear and exhaust in the front....am I missing something? I'll try to explain (I'm Norwegian, so english is not my native language. Yes, you are correct, the markings on the sprockets indicate the cams are correctly placed (the way they were before I disassembled). But when I look at the camshaft itself (not taking markings on sprockets into account), the camshafts are switched. According to the manual the camshaft with the raised section should be the intake camshaft. But on my bike, the raised section is on the exhaust camshaft. Must have been this way since factory assembly. So, I am wondering if this will make any difference. If the lifting height of the cams are identical and the cams in other aspects is identical, then the timing is OK, and there is no problems. anyway: I will reassemble the way it was, and probably all is fine. I did a search on the forums: There is already a posting about this. Seems the drawings in the manual is incorrect. So, mystery solved. I will delete this post within an hour, since it techinacally is a duplicate post. This topic also left in place as it illustrates issue mentioned.